Dave Carter circa 1995. Photo by Brenda Howard. THE LATEST NEWS: We are delighted to report that Judy Collins has recorded "When I Go" in a duet with Willie Nelson for her new album, STRANGERS AGAIN (Wildflower Records 2015). Ms. Collins astounded audiences at the Falcon Ridge Folk Festival this year with her heartfelt performance of the song. Video by Kathy Sands-Boehmer. DAVE CARTER began writing songs when he was six years old, but he did not enjoy national recognition until he was well into his 40's. 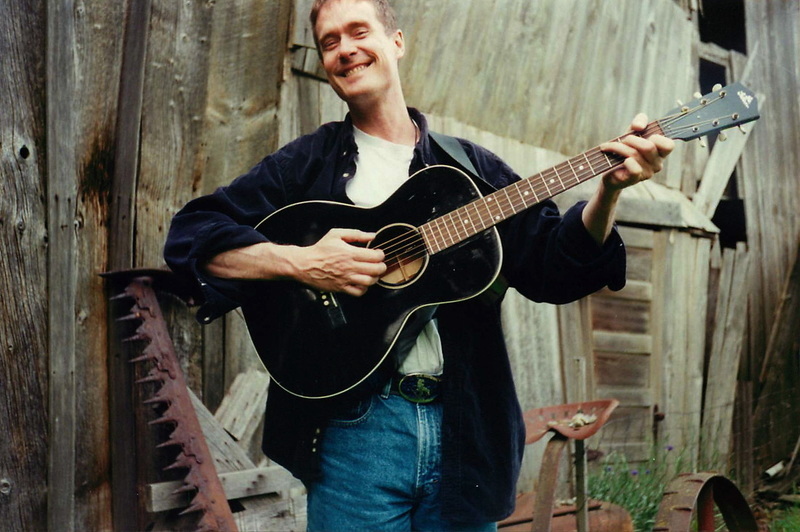 Carter's trajectory on the national folk scene spanned four short years, from his 1998 wins at the Kerrville New Folk, Napa Valley, and Wildflower Performing Songwriting Contests to a five-week tour with Joan Baez the spring of 2002. The summer of 2002, at the height of his popularity, he died of a heart attack while on tour. He was 49 years old. Over the past decade, artists at every level of the spectrum have performed Carter's songs, with Joan Baez, Mary Chapin Carpenter, Chris Smither, Richard Shindell, Lucy Kaplansky, The Kennedys, and Ellis Paul being among the most notable. To date, more than 100 different artists have covered the work of Dave Carter -- a testament to the resonance and reach of a masterful songwriter whose career was altogether too brief. Playing a sole and unique role in bringing Carter¹s music to the public is Tracy Grammer, Carter¹s touring partner, muse, and advocate from 1996-2002. In addition to sharing the stage with Carter, Grammer was the duo¹s first booking agent, promoter, accountant, publicist, and manager. Her unshakable dedication to Carter¹s legacy took hold in a small Portland bar where she first saw him perform; she continues to promote Carter's work to this day. Since 2002, Grammer has carried the duo's music to audiences around the world, sharing the songs and the stories behind them with fans who may or may not have ever seen the duo play live. She has worked tirelessly to continue to bring recordings, transcriptions, and archival materials to an ever-expanding fan base, doing everything in her power to ensure that Dave Carter's work and life story continue to circulate through the folk world and beyond. Preserving, fostering and promoting Dave Carter¹s music for the present and for future generations is a big job -- too great a job for one person, no matter how dedicated. A larger platform is needed to ensure the preservation of Dave Carter¹s folk music legacy, and every dollar helps us toward that goal. The Dave Carter Legacy Project is dedicated to the preservation, promotion, and engagement of the work of Dave Carter for present and future generations.